Layout: The South Kootenay Business Centre consists of fifteen fully-furnished office spaces ranging in size from 140 square feet up to 250 square feet. The presentation ready Board Room measures 465 sq ft. and comfortable seats 14 at the table. The casual meeting space is 274 sq ft. in size and has a fully equipped kitchenette. 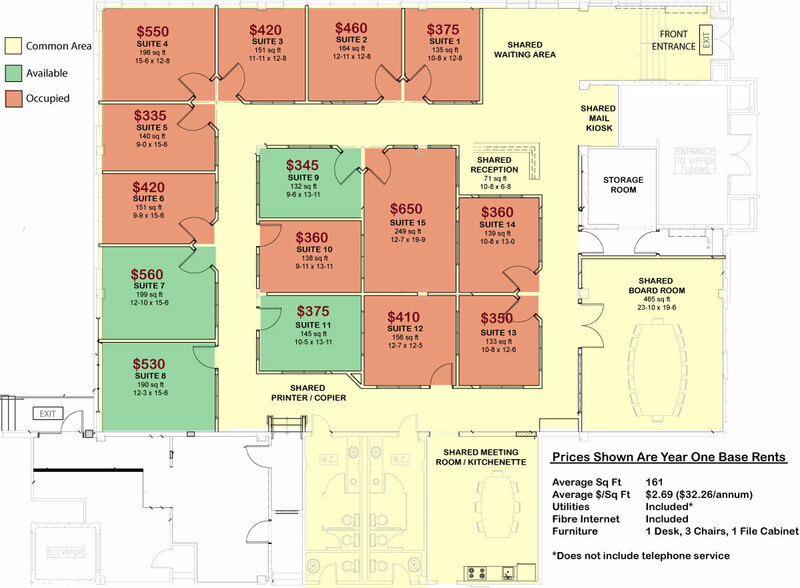 Pricing & Availability: Office dimensions, availability, and all-inclusive rental rates are shown below. To reduce startup costs for new and expanding for-profit business the South Kootenay Business Centre operates on a graduated rental policy. Under the policy we offer below market value base rents for three years. First year monthly rents are shown below. In the second and third year monthly rent increases by $50 each year. Business tenants may request a contract review for extended tenancy beyond 3 years. The incremental rental policy does not apply to non-profit organizations or charities.